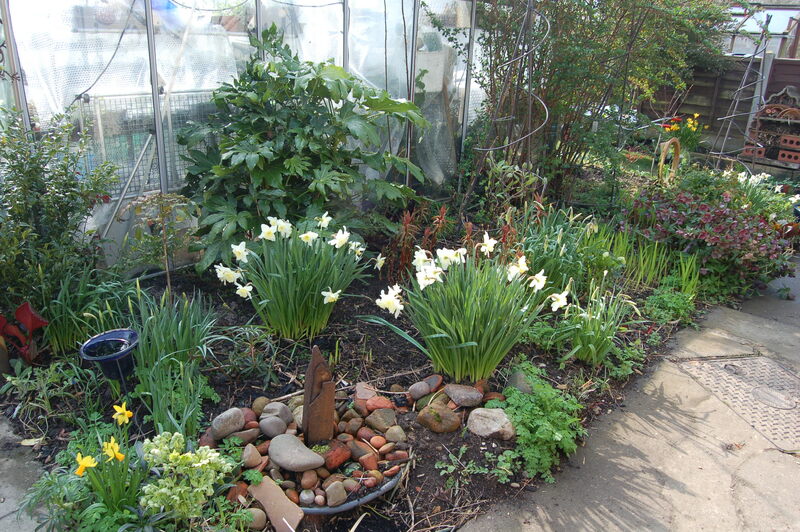 We looked at our garden in late winter to see if our aim of creating a garden with interest all year was paying off. 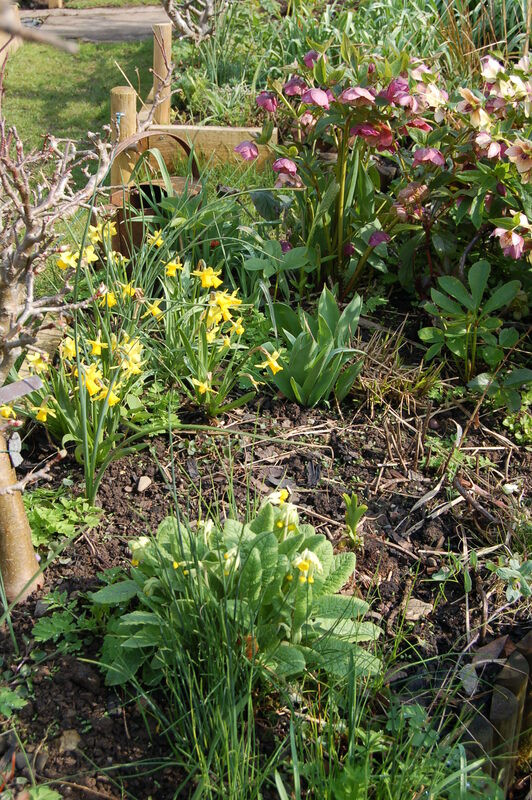 Now in Early April things have changed a lot in the garden since our last look so I thought we could have a look at it in early spring. Are we getting there? 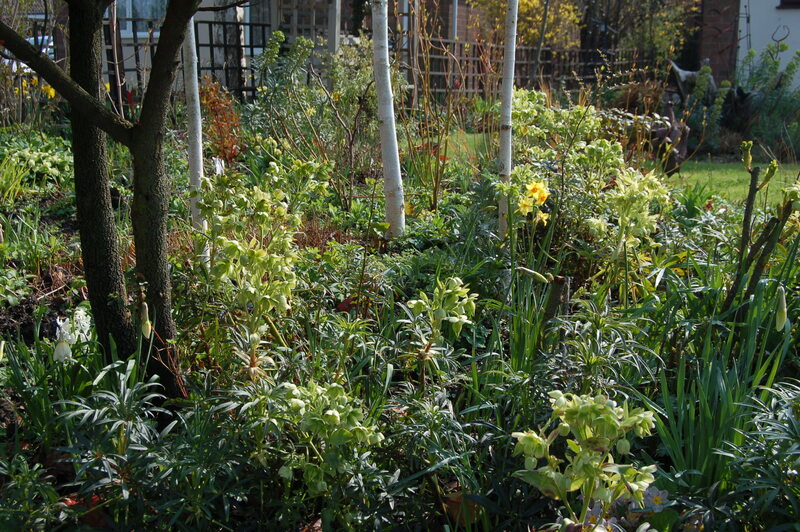 I shall start with a look out over our gravel garden, The Chatto Garden, which illustrates just how important Euphorbias are at this time of year. 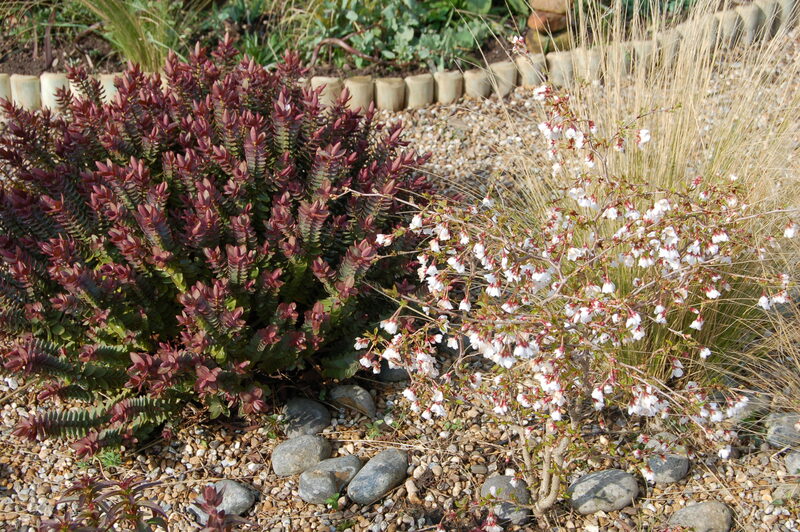 The second shot illustrates how our new border has developed since we planted it up earlier this year. 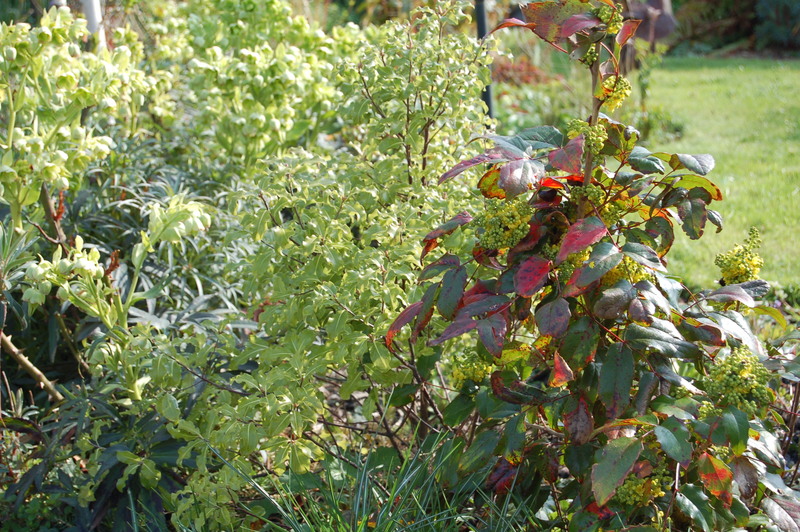 Foliage is still a key element in early Spring including fresh foliage of newly emerging herbaceous plants. Plants don’t have to be new to be good! 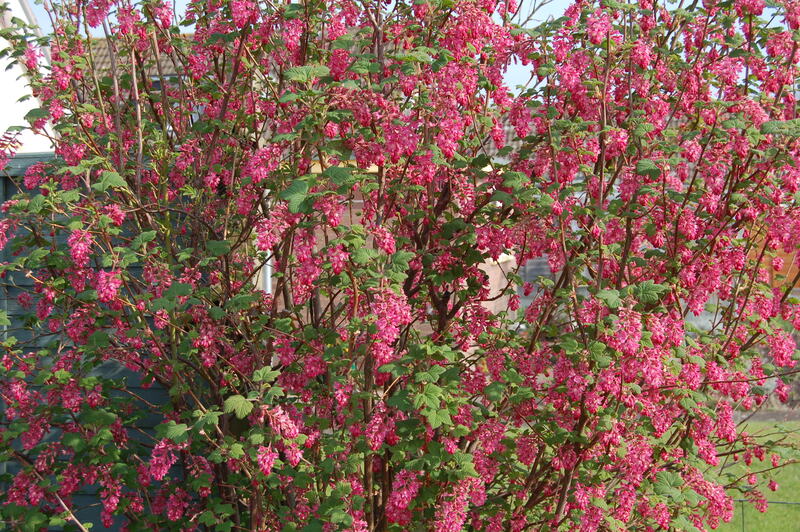 Just look at the old favourite shrub, the flowering currant – just ask the bees and they will say how important they are! 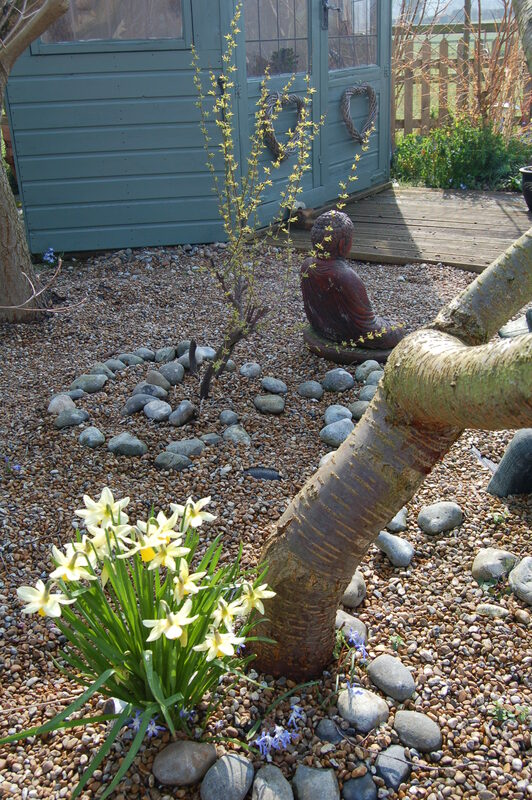 And of course daffodils and muscari bring life to our spring gardens every year without fail. 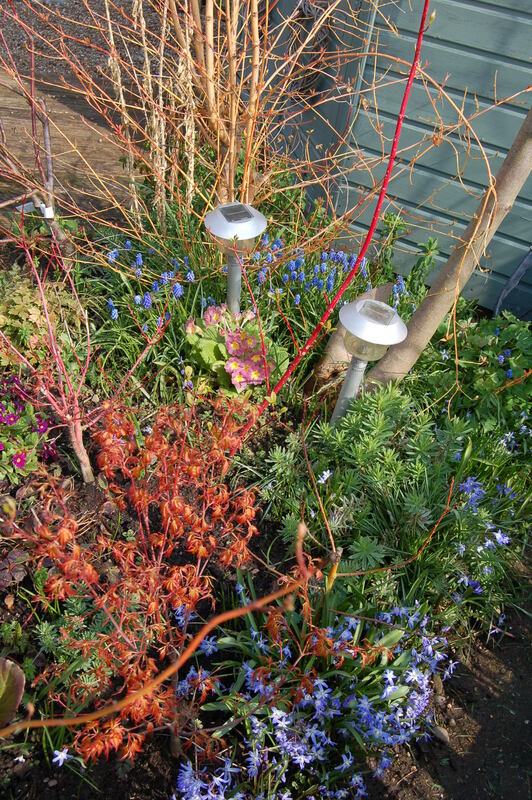 All bulbs give little splashes of colour to brighten the dullest spring day. 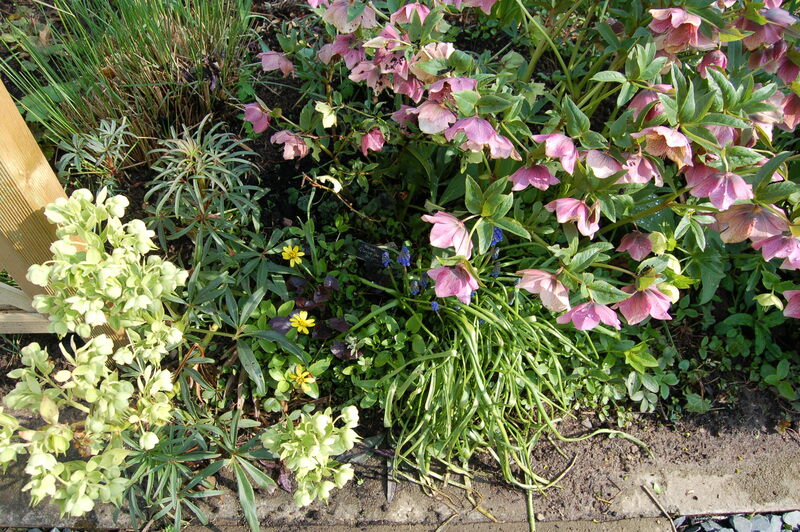 Our Hellebores are still going strong. 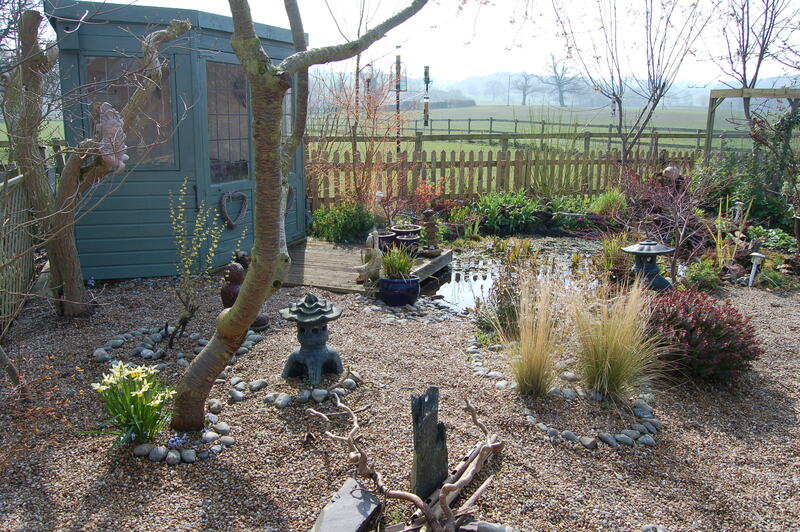 And now a quick visit to our Japanese Garden and the pond side border alongside. There is a lot of colour to find here. 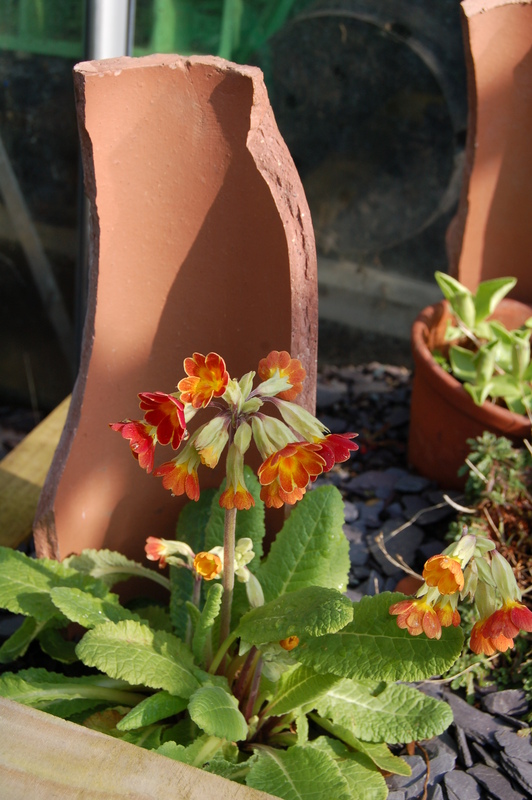 Our native Primrose is perhaps our favourite plant in our garden at this time of the year with the delicacy of its scent and colour. 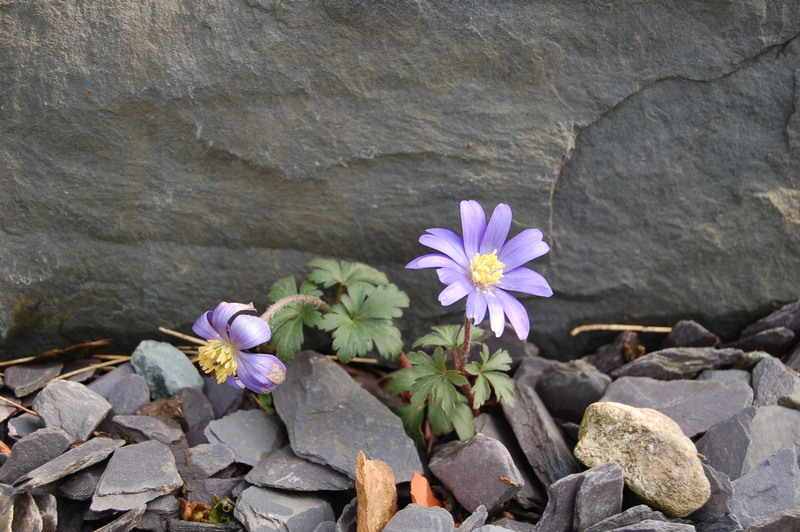 Other small flowers star before their larger neighbours take over the borders. 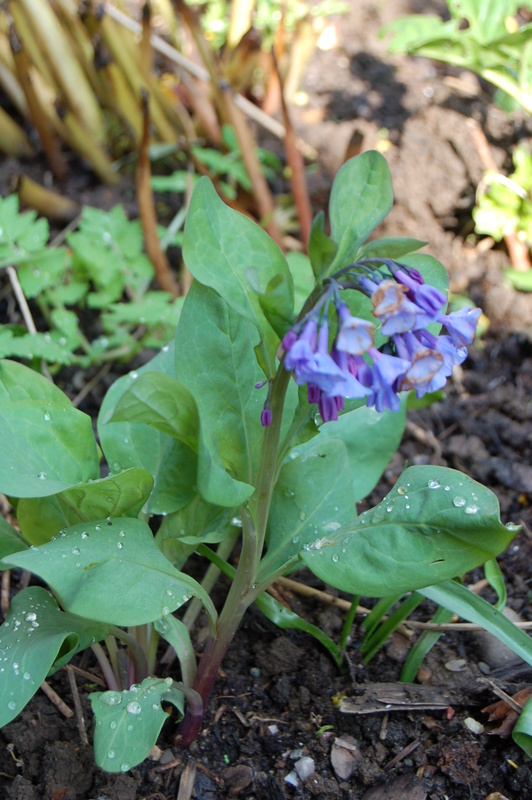 The star plant in our garden for early spring has to be the Chatham Island Forget-me-Not, Myosotidium hortemsium, with the flowers in a shade of blue that is so intense it is impossible to describe in words or give labels to. It lives in our Shade Garden so we have to make an effort to go and see it. It deserves our effort. 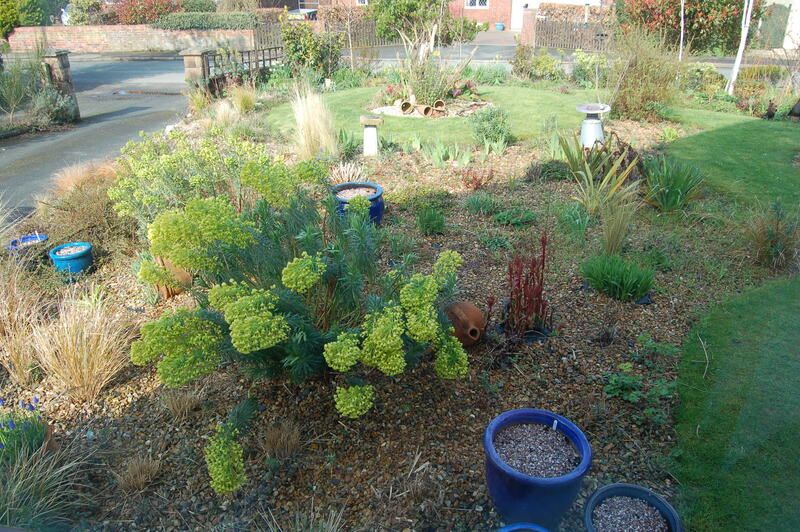 One part of the garden that we have given a spring clean to is the Seaside Garden which was in need of a face lift. 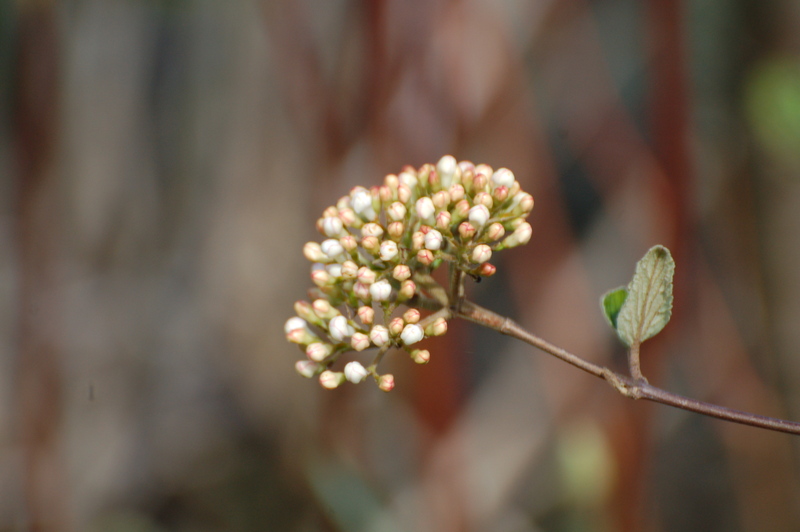 And for a promise of scent and colour soon to come we need to turn to the Viburnum family. There are just too many photos left so I shall move into a gallery for you to enjoy. 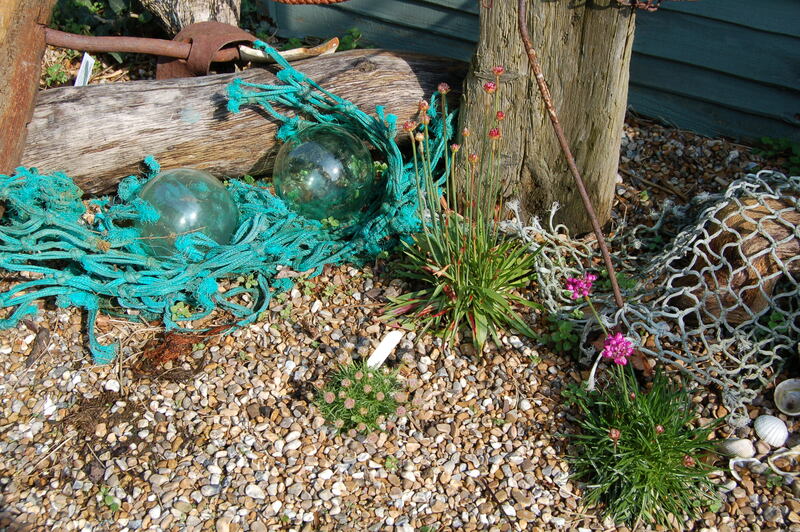 This entry was posted in colours, flowering bulbs, garden design, garden photography, garden ponds, garden pools, gardening, gardens, grasses, hardy perennials, light, light quality, ornamental trees and shrubs, photography, shrubs, spring bulbs, spring gardening, water in the garden and tagged bulbs, flowering bulbs, foliage, foliage plants, garden photography, gardening, grasses, organic gardening, ornamental trees, photography, shrubs, spring, spring bulbs, spring flowers, spring garden. Bookmark the permalink. 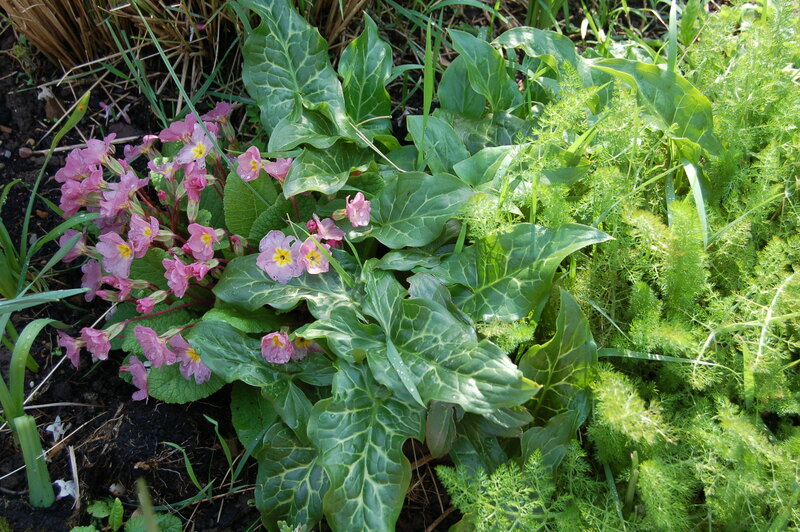 3 Responses to Aiming for a year round garden – early spring. 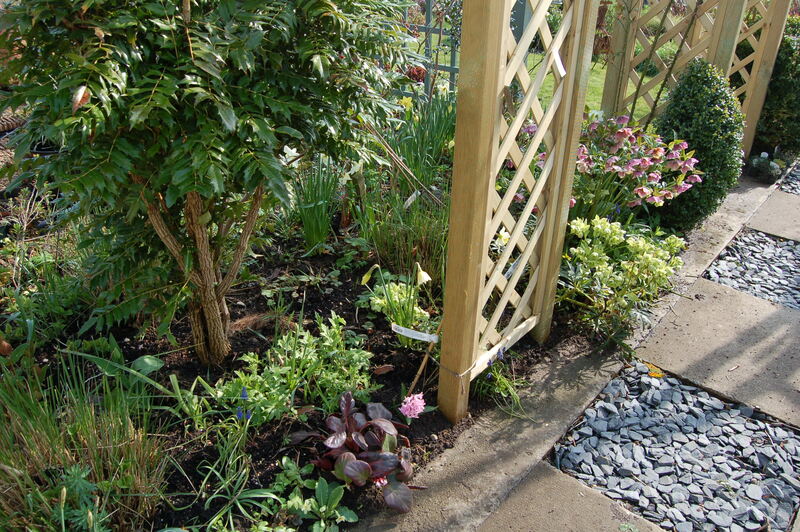 The set of images gives a sweeping view of your wonderful garden. Your hard work is worth this result. Many successes Malc! 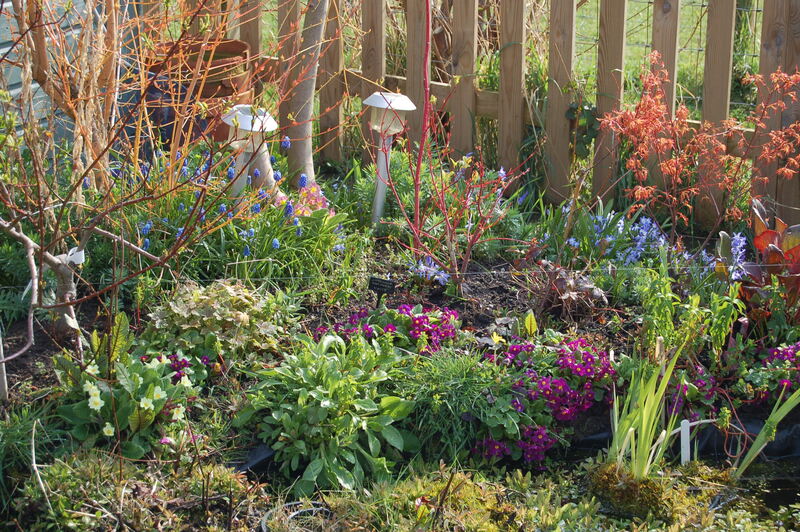 You have created wonderful garden spaces.